Who may use the car park? There are only 22 car parking spaces. These are available for use by owner occupiers, and on a first come first served basis. Permits are issued by the House Mnager against a list of owners. Flat owners, workmen and their visitors may obtain a visitor’s permit for parking in the forecourt by prior arrangement with the House Manager, and subject to availability. We regret that there is no parking available for tenants, however, meter parking is available in the roads adjacent to the block and, in addition residents may apply to Westminster City Council for a parking permit. Please note that if a car is parked in the block without a permit it is liable to be clamped or ticketed by our appointed parking control service. 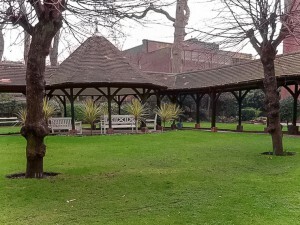 The communal gardens are for the enjoyment of all residents and are shared with our neighbouring blocks, Circus Lodge and Elm Tree Court. When using the gardens, please keep noise to a minimum and refrain from playing ball games. Also, remember that you may be overlooked by the flats facing the courtyard. What television access is available? The block has the facility for terrestrial and satellite TV through a common dish/aerial. There are analogue television outlets in all flats through which you can obtain Freeview channels if you have a digital TV receiver or via a Digi Box. We are able to supply cable television on a flat-by-flat basis and in addition, you may also receive pay TV channels though a BT telephone landline. Please contact the House Manager for more details. Individual TV aerials and satellite dishes may not be erected by tenants. What are the arrangements for recycling and household refuse? This block encourages recycling and there is a specially marked recycling bin on every floor. Please put recycling items into one of the recycling bins provided in the middle staircase of each floor. Alternatively you may place your recycling refuse straight into the large black recycling bin near the entrance to the car park. Please put household refuse in proper bin liners and place into one of the 3 black bins provided in the middle staircase of each floor. Alternatively you may place your bagged household refuse straight into the large paladins in the bin area off the forecourt. For the disposal of larger items such as white goods, flat owners must arrange a collection from the local authority. Please contact the Porter or visit the Westminster City Council Household Bulky Waste page for more information. If you experience any problems with pests please contact the House Manager immediately. High density living means that pests may not be an isolated occurrence and can spread quickly. We do not want a single occurrence to become an infestation. We can all do our bit to minimise the occurrence of pests and that includes keeping our flats as clean as possible.